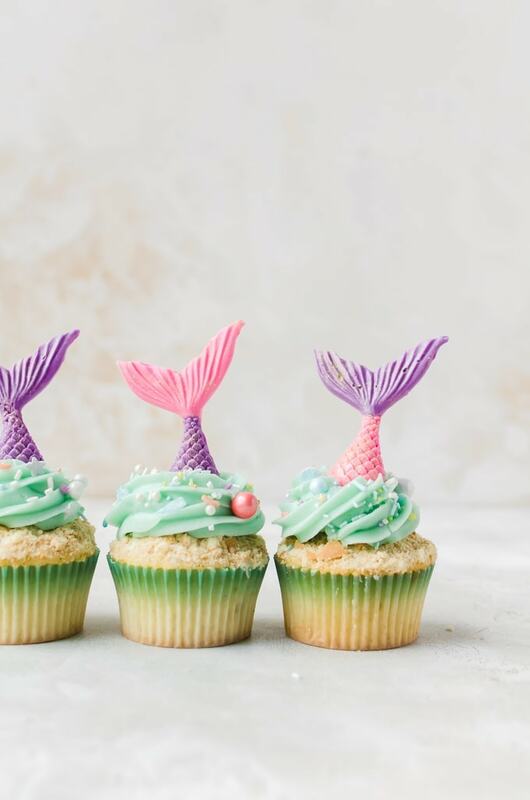 There isn’t anything cuter than mermaid cupcakes to brighten up your day. These cupcakes are so easy and fun to make and will make everyone’s day so much brighter. I mentioned before when I shared my Mermaid White Chocolate Bark that I was doing a mermaid theme for my daughter’s 7th birthday. First of all, how the heck did she get so old without me noticing? I can’t believe it. I still think of her as being a little toddler barely able to talk and now she is this sassy little lady. 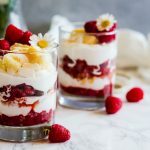 It sounds crazy, but sometimes I still don’t feel like I am ready to be a mom! I am sure there are other moms out there who can understand what I mean by that. 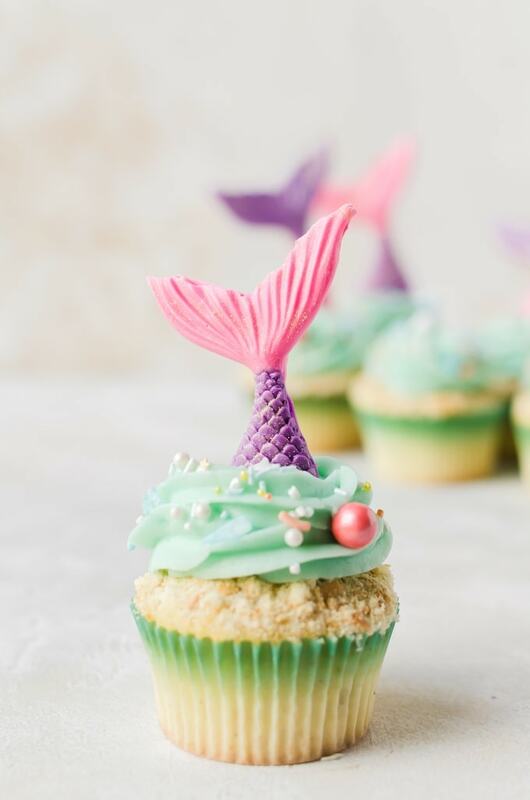 These mermaid cupcakes where thankfully a huge hit at the party. I did combinations of blue, purple, and pink and the kids all ended up coming up to the table to “reserve” the mermaid tails they wanted. I also made a cake that I shared on instagram that was topped with more mermaid tails with Nilla wafer “sand” and mermaid sprinkles. 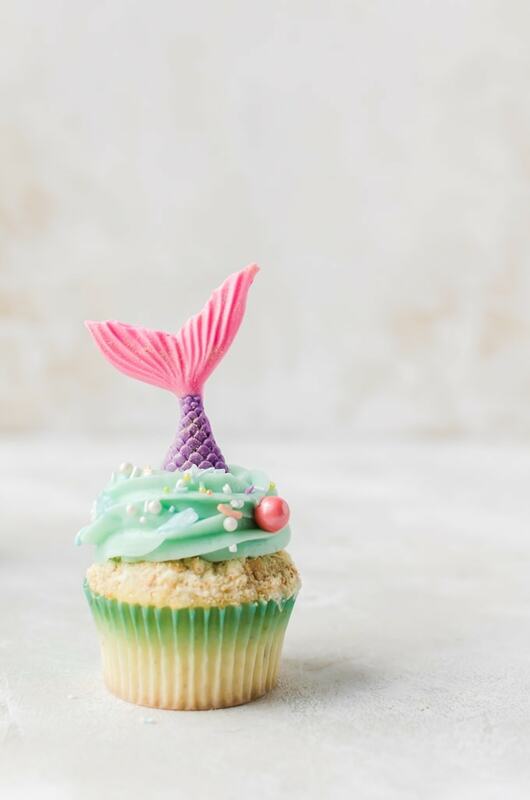 So these mermaid cupcakes were actually pretty easy to make. You start of with my basic vanilla cupcakes. Then you crushed Nilla wafers to make sand. You can use any plain vanilla cookies you want here. Then you make a large batch of vanilla buttercream. 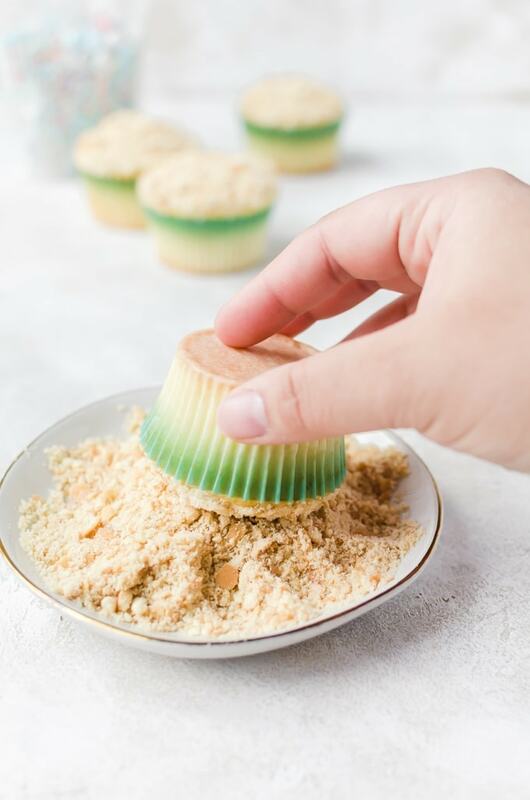 Spread a thin layer of buttercream on the cupcakes and dip in the Nilla wafers. Once that is finished, you add just a single drop of teal food coloring. My recommendation is the Americolor teal. I love this color. 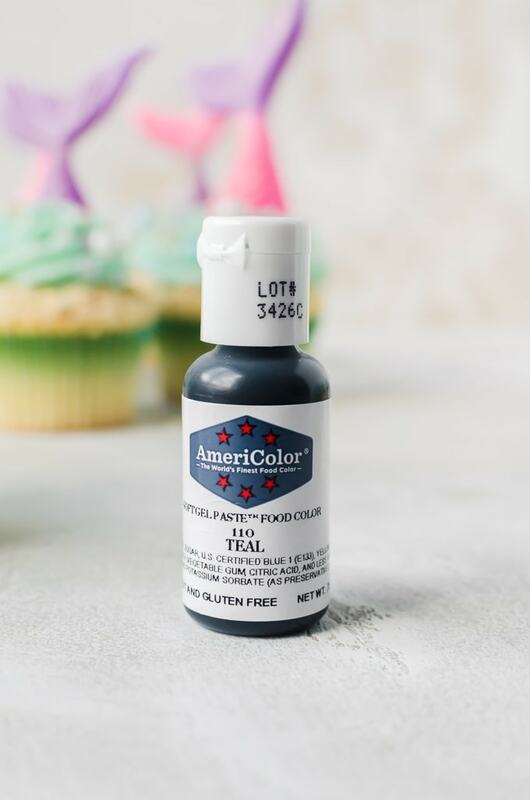 It makes the frosting the perfect shade with just a single drop. The hardest part about making these mermaid cupcakes is the mermaid tails. But they aren’t hard so much as they are a little time consuming to make, especially if, like me, you only have three mermaid tail molds. It requires you to constantly reheat your chocolate. My recommendation is to buy two sets of molds. The extra cost is completely balanced by keeping your sanity filling the molds. These are the molds I used to make these tails. There are two smaller ones and one larger one. 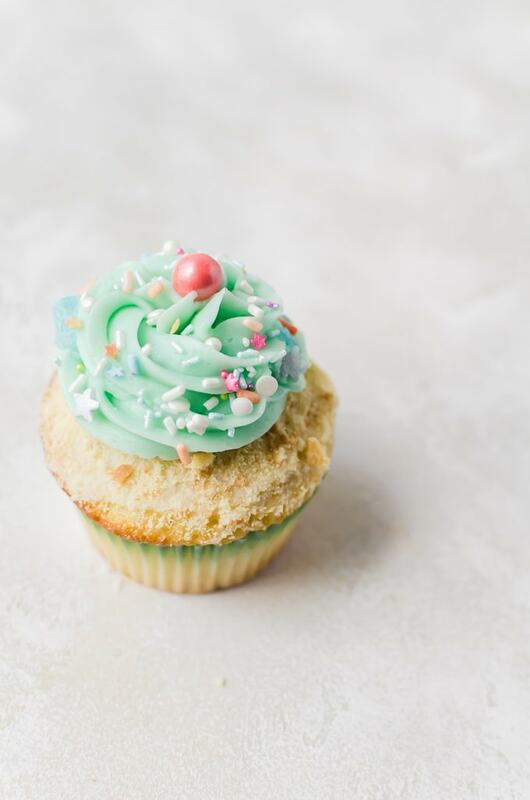 Both sizes still work for the cupcakes, but you do need to ensure your frosting is a bit on the thicker side to hold up to the weight of the larger ones. I just used colored candy melts from the local craft store to make the tails. They have a pretty good white chocolate flavor, but it isn’t real white chocolate. Honestly though, it’s hard to find true white chocolate with the cocoa butter in it. If you want something with a more sophisticated white chocolate taste, I recommend trying Trader Joe’s white chocolate mixed in with food coloring. Or you can keep them white and color with various colored glitter dust. I used gold as an accent for these tails. But as you can see, they are just as beautiful without the tails. As for the sprinkles, I spent a lot of time searching for the perfect sprinkles to use here. 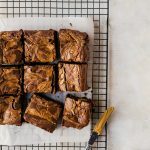 I spent ages on amazon, and etsy and baking websites looking for the perfect mix. I ended up feeling too picky about it and time was running out. In the end, I decided to do to the same shop, NeonYolk, I used when I got my Trolls sprinkle mix for her party last year because the woman who owns the shop is so incredibly sweet and wonderful, plus she is great at getting things shipped out to you almost immediately. I didn’t even know if she had mermaid sprinkles, but I figured something close would work because she deserved my repeat business. She does have a mermaid mix, and it was actually perfect because the shade of pink in the mix is just the same as in the gift bags we used. And friend, the mix is even prettier in person. Words cannot describe how happy I was to see the mix and see how pretty they are in the cupcakes. You need these sprinkles! They are worth every single penny. Start making the mermaid tails. Melt the chocolates. For easier application, use squeeze bottles to fill the molds. Add the chocolate to the molds and swipe away any excess off the top. Place the molds in the freezer for about 3 - 4 minutes. Carefully remove the chocolates. I recommend slowly pulling the mold from the chocolate around the thinnest area then slowly working your way around the chocolate to loosen it. Freeze unmolded chocolates as you work. 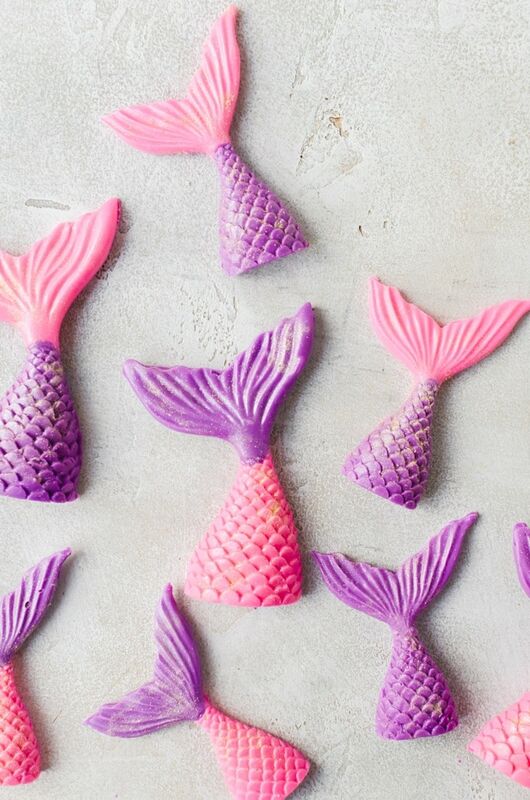 Clean the edges of the mermaid tails and then use a brush to brush the edible glitter onto the tails. Set aside. I recommend keeping them in the freezer until ready to top onto the cupcakes. Preheat the oven to 350 degrees F for the cupcakes. Line the cupcake tin with liners. In a medium bowl, mix together the flour, baking powder, and salt. Set aside. In a stand mixer, beat the butter and sugar together until light and fluffy - about 5 minutes. Add in the eggs one at a time, beat well between each addition of egg for about 3 minutes. Alternate between adding the flour mixture in three batches, and the buttermilk mixture in two batches. Mix until each batch is just combined. Do not overmix. I recommend folding in the last batch of flour by hand. Fill the cupcake liners with the batter until they are about 3/4 full. Bake for about 18 - 20 minutes, or until a toothpick comes out clean when inserted in the middle. Beat the butter until it is smooth. Beat in the powdered sugar in 1 cup increments, beating well after each addition. Add in the salt and vanilla and mix well. Add in the heavy cream until the buttercream is smooth and workable, but still on the firmer side so it can hold up the weight of the mermaid tails. Place about 2 teaspoons of buttercream on top of each cupcake and smooth out. Dunk the frosted cupcakes into the crushed Nila wafers so they are completely coated. Add the food coloring to the bowl with the remaining buttercream. Beat until the buttercream is fully tinted. Add a star tip to a piping bag and fill with the frosting. Pipe the frosting onto the center of the cupcakes, allowing the Nila wafers to be seen around the edges. Add sprinkles to the teal buttercream. Top the frosting with the mermaid tails, pushing down so they stay in. These are the cutest ever! I absolutely love them! The glitter is the perfect touch! These are ADORABLE! 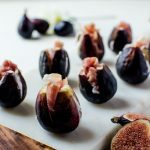 I will need to find an occasion to make these for sure. OMG these are so cute. I just make some BUG cupcakes for my grandson. These would be cute for my granddaughter’s upcoming birthday. I know she would LOVE them for sure….especially the colours! !